12.31.2006 - Thoughts and Discoveries from the US( 0 comments ) Wow.. Internet is SO slow on dial-up. Seriously, we're staying in what we call the Westgate Ghettos.. not quite as nice as the pictures and no internet on site! Even shady motels, McDonalds and other fast food restaurants like Krystal have wireless internet. Part 1 - Random Thoughts..
Anyways onto some random thoughts, I'll do my 2006 recap blog later on..
1) Finish Well - back to the grocery cart lady (see previous post). If you've spent 10-15 minutes grabbing everything you need, why would you abandon the cart? Why not finish and bring everything home.. it doesn't matter if you hit a shelf, dropped some eggs, almost hit a crippled man.... you should still check out your groceries. 2) Volleyball Withdrawal - last night I dreamed I was playing and made some spectacular digs. I woke up happy, then realized I couldn't have possibly played, as my ankle isn't fully healed! I think I need to play soon.. or keep dreaming everynight and wake up disappointed. 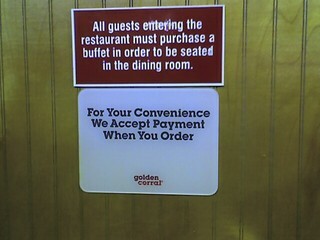 3) Ghetto US Restaurants - Golden Corral, some serious ghettoness.. who heard of a buffet/sit-down place where you had to pre-pay to enter? must be a lot of scammers who sneak out? Anyways this is the sign they had in front.. (pic below). 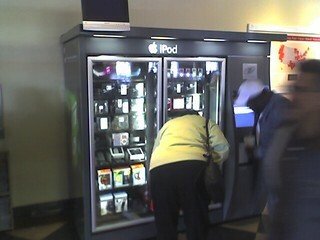 I was seriously perplexed. How is it convenient for us? It's like charging admission to a restaurant. Anyways there was this area by the buffet that smelled like washroom, trust me.. I checked with my sister and bro-in-law.. they both agreed. 4) Boxing Day: Where are the asians? 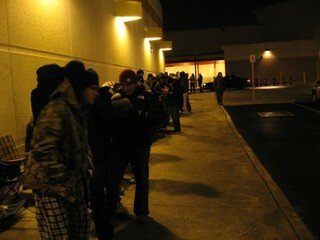 - Haven't been boxing day shopping in years since I'm normally not in the country... anyways I lined up in Richmond Hill on boxing day. The proportion of asian people was a lot lower than expected, guess we're not tough enough to line-up really early .. the lineup turned out to be prob 200 ppl before it opened at 6am? 2) Lost Clothes - you know how you sometimes can't find that shirt or pants? Here's one place to look.. my sis and I were hanging out, then my bro-in-law comes in with a pair of sweatpants..
a) he says they don't fit him and that they probably shrunk in the wash.
b) my sis looks at them, then says it's hers! haha.. ok.. that explains it. c) I take a closer look at them, and realized the sweatpants are mine! - they're size large, without debate, my sis agreed that she doesn't wear this size. anyone who debates this.. umm.. be prepared to face the wrath of my sis..
- I remember the placement of the nike swoosh on the bottom pant leg near the hemming. d) I decided not to take them back, they've disappeared for years.. I've already gotten replacements..
3) Transformers The Movie - new trailer is out.. looks pretty good! (link). While I'm at it.. here's a random "Transformer" related commercial.